the light to leak out diminishing the brilliance. inclusions will diminish the light reflected back out through the table of the diamond. For a clarity guide ask for details. of America (GIA) colour scale from D - Z.
is 3/4 carat, .50ct is 1/2 carat, and .25ct is 1/4 carat. One carat weight is equivalent to 0.2 of a gram. enhance their look and brilliance. 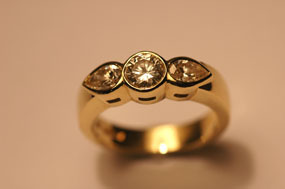 All diamond shapes are available from Guy Whitney. Ask for details. Copyright. Guy Whitney website, logo and jewellery designs are trademarks and protected under English Law.